Online registration is open for the 26th International BoatBuilders’ Exhibition and Conference (IBEX), which will be held October 4-6 at the Tampa Convention Center in Tampa, Florida. Show organizers have also announced the lineup of technical seminars for its highly regarded education program. 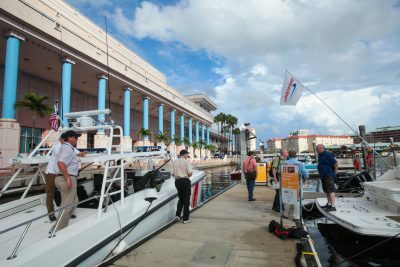 The 2016 International BoatBuilders Exhibition & Conference will return to the Tampa Convention Center in Tampa, Florida, on October 4-6. “The opening of registration coincides with the announcement of our 2016 education conference, a selection of topics from in-depth technical seminars to trends impacting the marine industry, which again promises to deliver education you can’t get anywhere else,” said Anne Dunbar, IBEX show director, in a release. Professional BoatBuilder editors and contributors are among industry experts who will be presenting this year’s seminars. Nigel Calder hosts the seminars Proper Electrical Installations, Solving the Energy Equation, and Engine Technologies. Roby Scalvini will co-host Surveying and Testing Spars and Rigging with surveyor John Koon, and Infused Laminates: Diagnosing Failure with composites specialist Andre Cocquyt. In addition, the magazine’s technical editor, Steve D’Antonio, will present seminars on Corrosion Prevention, Customer Care, and Avoiding Paint Failures in Aluminum Structures. Tampa’s waterfront location means that this year’s seminar program will include dockside courses. Other courses expected to be popular include the Return of Engineering Live (Parts I and II), which is just what the title promises—designers and engineers attempting to solve design challenges during the seminar. Beyond Boatbuilding looks at how boatbuilders can diversify by expanding their manufacturing into other industries; and New Advancements in Stepped Hulls is a panel discussion featuring Harry Schoell, Richard Akers, Rob Kaidy, and Robert (B.J.) Walling. Also on the design side, those searching for inspiration should check out the new seminar Inspired by the Real World: A New Approach to Design hosted by Bart Bouwhuis and Marnix Hoekstra. 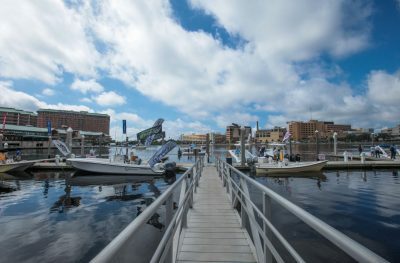 Seminar attendees will also benefit from the Tampa Convention Center’s waterfront location, which allows for dockside courses, including the American Boat & Yacht Council’s Electrical Troubleshooting, and Grounding and Galvanic Corrosion. Note that since only so many people can stand on a dock, space is limited for those classes. See the full schedule of this year’s courses here. To Register: Click here to register for the IBEX’s 2016 show, to be held October 4-6 at the Tampa Convention Center in Tampa, Florida. IBEX Seminar Series: The technical education program includes a range of courses—from fundamental skills to cutting-edge, advanced training—and is designed for shop floor crew, seasoned technicians, and company officers. 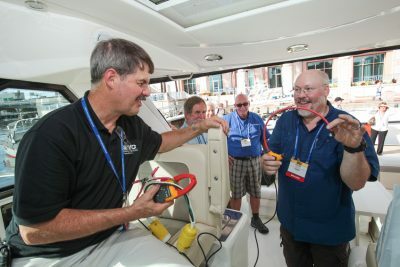 Leading experts host the seminars, which are specifically selected by the editors of Professional BoatBuilder magazine and the events’ other education partners, ABYC, ABBRA, NMEA, and NMMA. Another view of the Tampa dock, taken during the 2014 IBEX. Registration for the 2016 show is now open. IBEX Super Sessions: Held the day before the show begins, the IBEX Super Sessions offer specialty trainings, produced by exhibitors. Tech Talk Workshops: New products, short talks, and live demos give attendees the opportunity to connect, listen, see, and experience live presentations hosted by exhibitors every hour on the hour. Industry Breakfast: IBEX kicks off on Tuesday, October 4, at 7:30 a.m. with the Industry Breakfast, featuring the presentation of the IBEX Innovation Awards and the announcement of the NMMA Hall of Fame winners. The keynote speaker for the event will be Kevin Harrington, the inventor of the infomercial, and “original shark” on the ABC hit TV show Shark Tank. Since the ’80s, Harrington has launched more than 20 businesses that have grown to more than $100 million in sales each. Today he operates a private consulting firm, which works with companies to increase distribution. Exhibit Hall: The sold-out IBEX show floor is the largest North American annual technical trade event for boat building, design, and maintenance, celebrating over two decades of marine innovation, technology, and excellence. The 2016 event will add a first floor exhibit hall with more than 150 new exhibitors as a result of the growing strength of the industry. Featured exhibits include Future Materials, which shows off the cutting-edge materials and technology ideas coming your way, and the Connected Boat, an interactive display of the latest in wireless systems. For a complete list of exhibitors, click here. Discounts: Receive 10% off seminars if at least three people register for seminars from the same organization before September 9. Students, you can receive 50% discounts off established seminar rates, if you bring your marine school ID and register before September 9. If either of the above sounds like you and you’d like to receive a discount, e-mail Joanne Miller at jmiller@nullnmma.org or ibexregistration@nullexpologic.com.